Conceived in 1966 and completed on January 27, 1967. This work is unique. Artistic space needs to occupy and displace whatever we call the space that was there before. One of Judd's objections to painting is that it always deals with depicted space rather than real displacing space. Making three-dimensional space can be well done, but when done well, it is even possible to make more space than the previous volume displaced, or make an open space that is neither captive nor displaces anything else. Judd found enormous creative freedom possible from working within the discipline of existing material--plywood, galvanized iron, stainless stell and Plexiglas from Canal Street among others (Not unlike the history of music, with its rich tradition of variations on a theme). Moving completely into light industrial materials after 1964 meant the work needed to be fabricated, at some remove from his direct control. When successful, found materials, colors, light and the space they are used to create can be seamlessly appropriate, and inseparable. By 1964 Bernstein was making Judd hollow boxes in thin sheet-metal, largely galvanized iron and, after one small wall box in 1965, also in stainless steel. Adapted directly from the commercial work they had been doing for years, ductwork with 'Pittsburgh' seams and commercial sinks (Even the 'z' brackets for installing Judd's new boxes on the wall are standard sink and appliance hanger) required very little invention. It is easy to forget now how shocking these constructions of containers and boxd forms were. The fact that Judd was openly having his work done for him outside the studio by union sheet metal workers, even challenged the avant-garde art world of the 1960's. The material and boxes Bernstein was making to Judd's drawings were an appropriate fit for both Bernstein's capabilities and Judd's uses. Though there was a learning curve for both, the possibility now to order boxes in these functional, thin, strong materials, allowed Judd to expand his artist vision. Trying to acquire the skills and machinery to make these things himself would have been impossible. Almost from the beginning Judd began adding colored plexiglas to some of these Bernstein boxes, first translucent orange ('pebbled'), to add specific texture and slightly open the interior to colored light. At times he spray-painted Harley-Davidson motorcycle paint on galvanized iron or aluminum, but not to obscure their industrial origins. He considered their natural state a strength as both these materials are painted as often as not in ordinary usage anyway. Stainless steel, because of its clinical 'perfection', and because it has no need or history of being covered, is never painted by Judd. The results of hand-painting sheet metal were at times too disappointing and too often needed redoing. The whole process seemed too close to painting: More and more Judd chose Plexiglas instead. He told John Coplans in 1971, "the paintings were handmade, but none of the three-dimensional work is meant to look handmade",8 Plexiglas had "a hard, single surface and the color is embedded in the material"9, it had a certain verifiable thickness, and it was something Bernstein could do themselves. 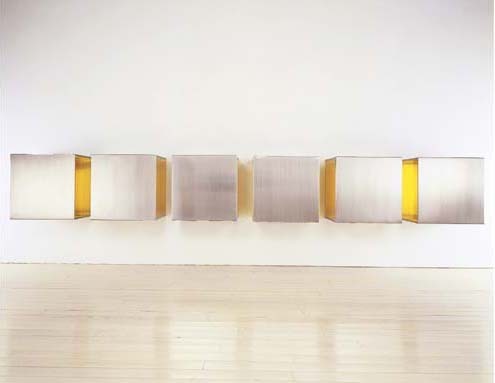 In December 1966, Judd ordered a large, six unit wall piece, Untitled, 1967 (1966), in stainless steel and transparent yellow Plexiglas from Bernstein Brothers, (by this time in Long Island City). The stainless steel was standard number four mill finish, one-quarter inch transparent yellow 2208 Plexiglas was supplied to Bernstein cut to size from Cadillac Plastics. Flat sheets of stainless steel were cut on a shear, folded on a break and assembled. The top-front-bottom was one piece, the backs were separate parts. In theory at least, parts from all the six boxes were interchangeable. With Untitled, 1967 (1966), Judd intended to claim and color as much space as possible, including the spaces between the boxes, 12 without using entirely closed or open forms, applied paint, or the physical connector he used in earlier related pieces. Because the boxes are sealed, and because of the compounding effect of their being in series, the space making is intense. The unresolved tension he arranges between thin, tight, functional, antiseptic stainless steel 13, and yellow, the largest color 14, and their separate histories, is remarkable. Peter Ballantine worked with Donald Judd for twenty-four years, and continues to be an important authority on Judd's work. He is Art Supervisor for the Donald Judd Estate. 1 The piece, listed as DSS 101 in the 1975 Catalogue Raisonne, should correctly be dated 1966, when it was purchased ordered, consistent with Judd's career-long practice, not when it was completed or invoiced. The Catalogue's method is no consistent on this. 2 Judd uses 'colorist' only once, referring obliquely to Van Doesburg referring to architecture. 3 It was prepared as a lecture he was to have given in Amsterdam in November 1993 when he received the Sikkens Award, given by the Dutch paint company. 4 Only the last third of the essay is entirely about color, an explanation, almost a defense, of his use of applied opaque paint (and detour in the direction of color composition), with the so-called 'Swiss' painted aluminum pieces during the period 1983-87. Judd is not happy with applying color. His justification is a little self-conscious-basically that thin painted sheet metal so well understood in this culture, from painted cars, that it is not painting per se so much as (almost) found object. Judd finds color decisions less unpalatable if the choices can be limited to existing colors, e.g. the RAL color chart or the limited number of Plexiglas samples. 7 Natural light, a condition for looking at art so essential that he considers it a given. He wrote very little about it but spoke about it all the time. 14 See taxis, school buses, caution tape, text highlighters, highway markings, fall-out shelter signs, airplane oxygen masks, sunlight, candlelight, electric light, gold (and its depiction); modern fire engines are yellow, (red symbolized/depicted fire, yellow is about being seen); the brightest color on the stoplights is yellow, alerting to change. The stoplight housing itself is yellow. Yellow signals sexual allure in flowers, ripeness in fruits, poison in insects and snakes. "It was never a question of whether you liked Judd's work or not; you could not get over it. It would not leave you alone. It gnawed on you. It made you drop dearly held beliefs. It was not 'obvious' art; it didn't look like art. Nevertheless, it insisted on being taken seriously." Judd came to his wall works--progressions and stacks--after of series of paintings, then floor sculptures in the earlier part of the 1960s. Wall works begin in 1964, and when asked about their order of development, Judd says to John Coplans " the progressions come altogether in fact, because of [an earlier] wood piece, the progressions slightly precede the stacks" 2 (Coplans, p.39). These works coalesced for Judd when he honed his relationship with his fabricators, and freed himself to focus on his primary concerns-form and color. Formally, the horizontal progressions illustrate Judd's early interest in architecture, and to what would later be called ergonomics, or for Judd the necessity in maintaining a scale that relates to the human body, and therefore, the viewer. Judd states. "Some of them go to the side walls, and the intervals between the walls and the boxes are identical. So they are related to the architecture, like the stacks, but horizontally instead of vertically. The height of the boxes from the ground is also critical. The viewer is meant to see a little of the top of the boxes, but the ceiling height doesn't matter. They should be hung at either 62 or 63 inches. The choice of the height is meant to avoid flattening the boxes when they are on the wall. If the viewer can see a little of the top plane it's going to keep them three dimensional." 3. His boxes seem weightless allowing the viewer to focus more on form than mass, while maintaining a sense of geometry that gives rhythm to his spacing-34, 8, 34, 8, etc. There is no heirarchy in the composition of the piece; the boxes are presented directly and symetrically. There is the space that each of the 34 inch square boxes contain. There is the space of the eight inches in between each of the six boxes that frames each element. There is the space of the wall framing the work, and then the piece itself holding these volumes in the room itself. Untitled 1966-67 is made of stainless steel with yellow Plexiglas, installed in such a way that one is very conscious of its amulet-like power and clarity in artistic vision. The unties, made in thin, high-grade stainless steel, a clean, precise and refined material in its natural state helped Judd achieve many goals. First, there was the shift away from traditional materials and the need for Judd to physically make works in the studio. This break from art history, both in using an outside, industrial fabricator, as well as using new materials and technology to make the works was extremely liberating for him. 4 The elimination of the handmade look and the fact that the stainless steel required no intervention by Judd, (it was perfect in color in its intrinsic state), allowed Judd to devote more attention to color, a passion of his that encouraged Dan Flavin to name a 1987 sculpture of his to be titled "to Don Judd, colorist". By using yellow Plexiglas, a material, unlike almost any other, lived up to the artists' stipulation that material and color should come together to form a single entity, for color is truly inherent in Plexiglas. Yellow calls to mind the warmth of light itself-a major concern for Judd-countering the cold surface of the steel. As light reflects off the surfaces, the illuminated sculpture appears almost to float, revoking the physical mass of the work. Yellow is high-powered color for Judd and he used it quite sparingly, because of its visual radiance and energy. In this work, perhaps more strikingly than Judd's other choice colors (red, amber, pink, etc. ), the space inside each box is infinite and expansive, rather than conveying the sense of containment. Untitled, 1966-67 is an outstanding example of Judd's work in form, in color and in precision of artistic vision. 1-Donald Judd, Early Fabricated Works, Pace Wildenstein Gallery, New York, 1998, p.14, as cited from Robert Smithson's 1965 article "Donald Judd (1965)." 4-Elger, Dietmar, "Introduction Donald Judd, Colorist" in Donald Judd, Colorist, Hatje Cantz, Bonn, 2000. p.20.